BelarusDigest > Social > The crisis of Belarusian youth sport: can we expect a new Domracheva? At the Pyeongchang 2018 Winter Olympics, Belarus finished 15th in the medal table with two golds and one silver. The result represents a true sporting achievement for a country with a relatively small GDP. Yet, despite the triumphs of Darya Domracheva and Hanna Huskova, the Belarusian team failed to repeat its success at the 2014 games in Sochi when Belarus finished 8th in the medal standings. 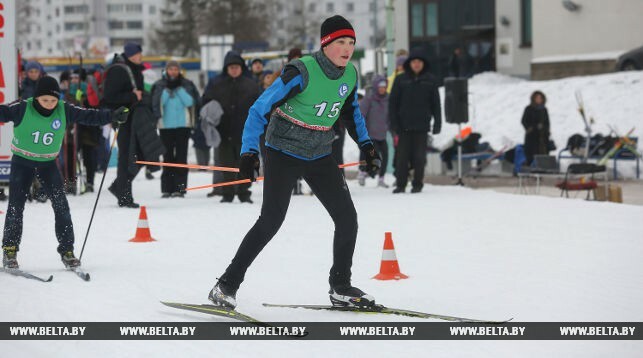 Belarusian youth sport faces several problems which reduce expectations of victories at Tokyo 2020 and Beijing 2022. First, numerous sports clubs lack either private sponsorship or state support. Secondly, poor salaries reduce the motivation of talented youth coaches for career advancement. Finally, an abundance of entertainment, as well as the high cost of sports equipment, prevents youngsters from attending sports schools. For these reasons, instead of investing in sports infrastructure, the Belarusian government needs to support youth coaches. An efficient approach towards youth sports will improve the results of Belarusian sports teams in future. As a part of the USSR, Belarus produced numerous sporting legends, including Olga Korbut, Vital Scherba, and Alexander Miadvedz. Belarusian sportsmen and women have traditionally demonstrated impressive achievements in fencing, gymnastics, rowing, track and field, skiing, and wrestling. The Soviet period left behind strong sports traditions and an excellent coaching system. However, the rapid breakdown of the Soviet economic system took its toll on the development of sport in independent Belarus. Nevertheless, Belarus managed to preserve strong Soviet sports traditions in biathlon, freestyle skiing, rhythmic gymnastics, rowing, wrestling, and weightlifting. In Pyeongchang, Belarus – with a GDP per capita of just $4,989.25 (2016 figure) – finished 15th among 92 competing nations. 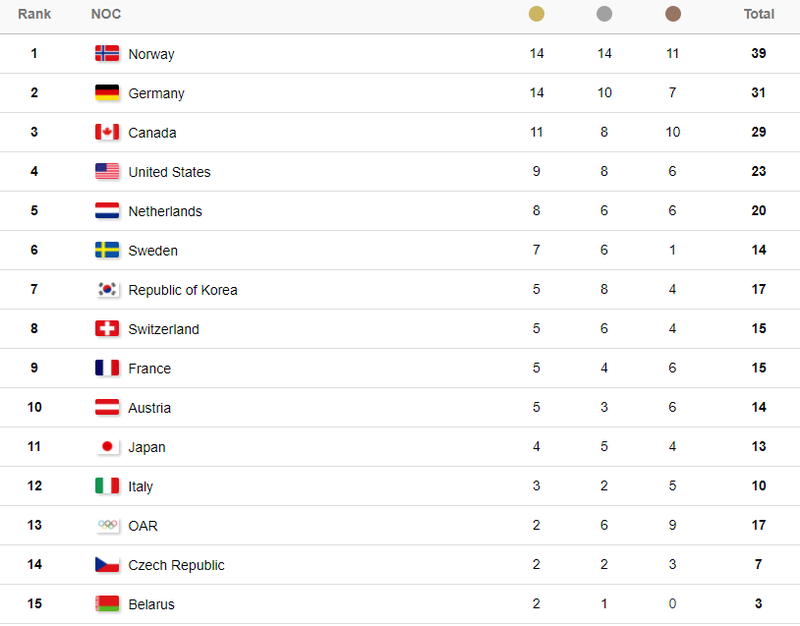 In comparison, the GDP per capita of Norway, which topped the medals table, amounts to $70,812 (2016); the GDP of 10-million-strong Sweden – $51,559 (2016); and the GDP of Austria with 8.7 million people – $44,176 (2016). 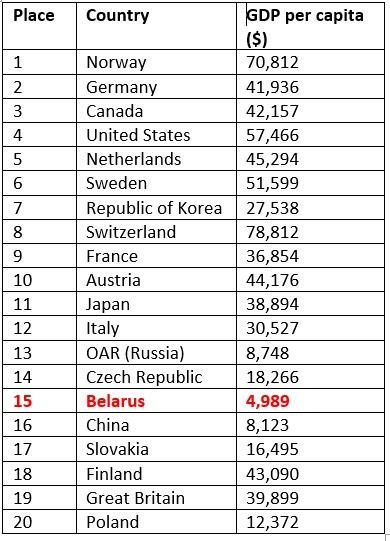 Belarus, the poorest country among the top 15 medal winners, managed to do so well despite its economic hardship. A stable medal flow leaves hope for future Belarusian sporting achievements. However, Belarusian sport faces a number of problems. After the break of the Soviet Union, Belarusian sport had to adjust to a market economy. In order to attract serious sponsors, sports events required tens of thousands of spectators. However, despite cheap tickets, sports events have never managed to attract regular crowds in Belarus. For instance, only 3,864 spectators supported the national football team in its European Championship qualifying match against Slovakia. The attendance at ice hockey matches has turned into a farce whereby students fill empty stands in exchange for better grades for years. So far, the national sport has failed to be considered first-rate entertainment among Belarusians. Since Belarusian sport cannot provide for itself, the Belarusian government obliged enterprises to finance sports teams across the country. For instance, the Belarusian Potash Company “Belaruskali” sponsors the “Shakhtyor-Saligorsk” ice hockey club, while OJSC “Byelorussian Steel Works” sponsors another ice hockey club, “Metallurg-Zhlobin”. However, the level of financial support depends on the profitability of each particular enterprise and, in cases of bankruptcy or financial crisis, teams must survive without support for months, if not years. Financial straits have put an end to several Belarusian sports teams, including male volleyball teams from Hrodna and Homiel. Aside from financial challenges, Belarusian sport faces a decreasing talent pool. At present the national sports industry competes with numerous entertainment giants. Films, concerts, clubs, cafes, the internet and computer games simultaneously fight for young Belarusians’ attention. While Soviet youngsters pursued sports activities due to the lack of entertainment, contemporary Belarusian teenagers possess plenty of it. Moreover, music idols such as Rihanna and Jay-Z score higher in teen popularity than the biggest national sports stars, including Victoria Azarenka and Alexander Hleb. As a result, many potential sporting talents do not develop their potential. Expensive sports equipment also deters talented children. Youth hockey equipment costs between $600-800 (approximately one-and-a-half times the average Belarusian monthly salary); especially problematic for a growing teenager who requires new hockey equipment each year. A rhythmic gymnastics suit costs $400 and lasts just half a year. A high quality tennis racquet costs about $3,000 (or nearly eight times the average Belarusian salary). Belarusian parents therefore have to think twice before investing in their child’s sports activities. In this way, the proclaimed state support for national sport looks rather hypocritical. Belarusian youth coaches have outlined two major problems harming the development of Belarusian sport. The first problem concerns poor salaries for a highly challenging job of coaching children and teenagers. At present, Belarusian youth coaches receive between $200-350 per month, even less than the official average salary of $426. Consequently, the best specialists quickly move into better-paid roles coaching adults and prospective juniors. The second problem relates to a decline in the quality of coaching education. The lack of professional prestige deprives sports faculties of a competitive selection. As a result, education standards also drop, as does motivation of young specialists. Aside from this, Belarusian sports specialists rarely attend international conferences or apply creative teaching approaches. Therefore, a higher education diploma in physical education does not guarantee a professional coach. To conclude, Belarusian youth sports undergoes a crisis, which has stemmed from its slow transition to a market economy. Youth sports schools suffer a shortage of talent, sports clubs lack sponsors, and spectators are not entertained. The primary task facing Belarusian sport remains to increase its target audience. As soon as national sports become important for Belarusians, they will attract sufficient financial flows. As for state support, the major investment should be redirected into supporting youth coaches instead of building infrastructure. The Ostrogorski Centre in cooperation with the Anglo-Belarusian Society is pleased to present the newest issue of the Journal of Belarusian Studies. Established in 1965, the Journal is oldest periodical on Belarusian Studies in the English language. The 2017 issue of the Journal begins with an article authored by Lizaveta Kasmach. Her recently completed PhD, written at the University of Alberta in Canada, deals with the Belarusian nation-building in the context of the First World War and Revolution. 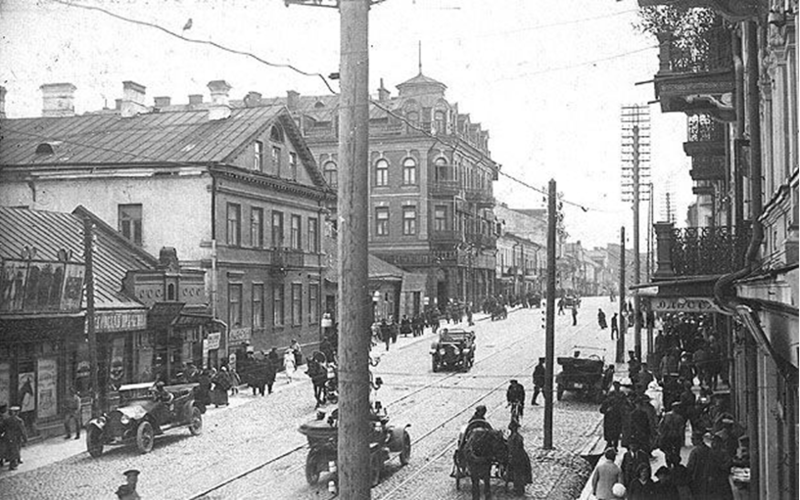 Her article here analyses the challenges of national mobilisation of Belarusians in eastern Belarus in 1917. At that time the February Revolution in Russia opened up new opportunities for national activists to engage in politics. Lizaveta highlights two key obstacles which prevented activists from succeeding: the legacy of decades of Russiﬁ cation and the local (rather than national) identity of the Belarusian population. During that period, people were avoiding clear-cut national identities and instead identifying themselves with a certain region or settlement. In accordance with people’s strategies for survival, they did not imagine themselves as members of a separate Belarusian nation. Tatsiana Kulakevich from Rutgers University analyses Belarus in Congressional Record between 1873 and 1994. The author highlights the importance of diaspora activities in the United States, which helped to place Belarus on the world map in the minds of the American political elite. From a voiceless territory under Russian inﬂuence Belarus became a separate country suffering from Communism and deserving the right to national independence. Uladzimir Kananovich writes about Francis Skaryna, one of the ﬁrst East European book printers, who laid the groundwork for the development of the Belarusian language. Although the proﬁ le of Skaryna has been analysed in the literature, his interest in astrology has not been properly explored. Francis Skaryna was also a medical practitioner with a keen interest in astrological prognostication. 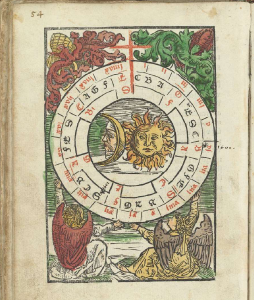 The appearance of the symbol of a sun charged with a crescent moon in his most famous engravings may be attributed to Regiomontanus’s inﬂuence on Skaryna as well. The article of Uladzimir Kananovich resulted from his presentation at the second annual conference of Belarusian Studies which took place in London in March 2017. The conference was organised by the Ostrogorski Centre in cooperation with University College London and the Belarusian Francis Skaryna Library and Museum. Speakers from Belarus, the United Kingdom, Japan, Germany, the United States and other countries presented and discussed Belarus-related research. The conference panels covered Francis Skaryna’s work and legacy, problems of Belarusian national identity, the foreign policy of Belarus and comparative politics, social and political movements, and Belarusian language and literature. The main conference was followed by the Annual Lecture on Belarusian Studies, delivered last year by Dr Ales Susha, deputy director of the National Library of Belarus and chairman of the International Association of Belarusian Language and Culture Specialists. The annual lecture, as well as podcasts of all conference panels, can be found online on Soundcloud. Siarhei Bohdan from Berlin discusses a book on Soviet Belarusisation, trying to distill myths from reality. Aliaksiej Lastoūski from Minsk reviews a book published in Polish on how Belarus is viewed in the European context from the philosophical point of view. Roman Urbanowicz from Budapest looks at a book on informal cross-border trade and gender issues. 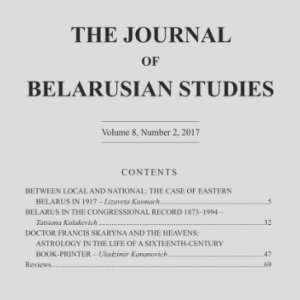 This issue of the Journal of Belarusian Studies also includes the annual report of the Anglo-Belarusian Society prepared by its chairman and former British ambassador to Belarus Brian Bennett. The journal accepts submissions on a rolling basis and welcomes contributions from younger and established academics on all aspects of Belarusian studies.